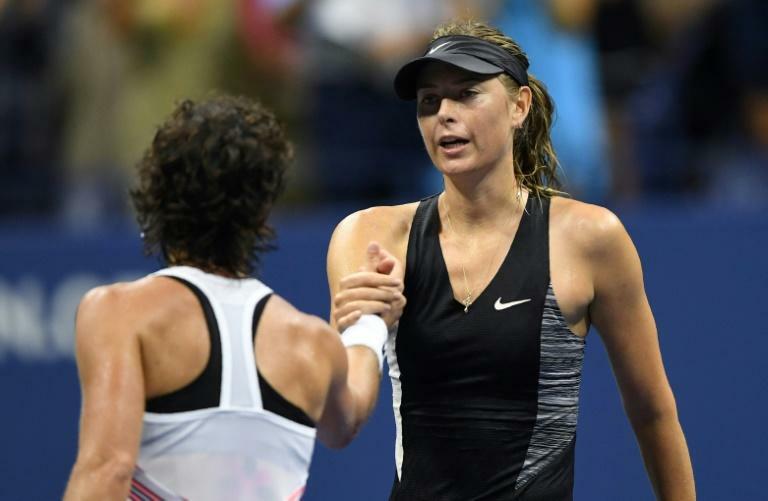 Maria Sharapova laughed off suggestions that losing in the US Open fourth round represented the toughest period of her life. That, she insists, came when she arrived in the United States with her father -- but without her mother -- and just $700 in their pockets. "What's challenging is when you're a teenager and you have a few hundred dollars and you've got no sense of the future, you don't know where you're going to end up. You just have a dream," said Sharapova. "I think that's a lot tougher than being 31 years old and having the opportunity to do whatever I want in my life." Sharapova, speaking after losing 6-4, 6-3 to Carla Suarez Navarro on Monday, was referring to the time when at seven years old, she left Russia for Florida. She and father Yuri spoke no English when they arrived in the United States while visa restrictions prevented the young Sharapova from seeing her mother Yelena for two years. Those traumatic days have long since given way to one of sport's most powerful rags-to-riches stories which has seen Sharapova earn a personal fortune estimated to be in the region of $200 million. But despite her sense of perspective on Monday's defeat, there remain question marks over whether or not Sharapova will ever return to the peak of her powers. The last of her five Grand Slam titles came at Roland Garros in 2014 with the period since interrupted by a 14-month doping ban. She made the fourth round at the US Open last year in her first Slam since her return, the third round in Australia in January and quarter-finals in Paris before a first round exit at Wimbledon in July. That loss to Vitalia Diatchenko, the world number 132 at the time, at the All England Club was her first opening round Wimbledon defeat and earliest Grand Slam exit in eight years. On Monday, Sharapova was attempting to reach the quarter-finals in New York for the first time since 2012. But she ran into an inspired Suarez Navarro who marked her 30th birthday with a second win in five meetings against the Russian. The defeat was also Sharapova's first in 23 matches played under the Flushing Meadows lights -- 22 of those on the showpiece Arthur Ashe Stadium. She is adamant that her best days are still ahead of her. However, her performances at the US Open this year exposed serious flaws. In her four matches, she served up 32 double faults and dropped serve 15 times. She carved out a tournament-leading 49 break points but converted only 21, a success rate of 43 percent. Her bitterest rival Serena Williams, after four rounds, has just nine double faults and has been broken only three times. The American has a 62 percent conversion rate on break points at 18 of 29. "If I didn't have the belief to keep doing this and to keep having the motivation and the grind of doing this every day in order to get myself in these positions, I don't think I would be here," said Sharapova. "I think I've done plenty in my career, established a lot for myself personally, professionally."